Have I done well enough? My Facebook feed is often full of £10k watches and AMGs and Michelin stars – and that’s just on dental groups. Principals with massive silver cars posting about which celebrity they are dining with. Associates placing their fiftieth implant that week before flying business class to a Greek island for the long weekend. Hashtags usually follow. #hardworkpaysoff #workhardplayhard #success. The brainwashing power is real. Its psychological effects can be felt deeply. You may also be working hard, perhaps six days per week, and you have a small silver car and are saving up for a holiday, let alone a house deposit. We don’t know what education they have invested in, how many extra hours they have put in to master a technique, how well they can talk to patients… or if it is all smoke and mirrors. Hard work and determination (grit) are the most important factors in determining success or failure in any area of life. The most important currency you own is your ability to affect other people. This is called social intelligence. Dental failures, particularly those we don’t understand, are extremely demoralising and frustrating. They make us feel like a failure rather than a success. Precise, well executed dentistry works. It lasts for years and years, it doesn’t fall off or fail, and can be highly profitable if the fee payers value this worth. You are more likely to make mistakes when doing a job you don’t like than when doing one you love. So how do you fit into those five facts? Did you expect it to all just land on a plate for you? Leave university and walk into a job in an immaculate pristine surgery with billowing white drapes, state-of-the-art equipment, a nurse who is a beautiful Nordic princess, and a principal who pays you in advance and gives you financial reward for kindness, dedication and taking a little longer to make sure the job is done right. Oh dear. Perhaps we should ask ourselves five groups of questions related to those points. Are you gritty and determined? Have you worked with a determined mindset on a particular goal? Why did you choose dentistry? Parents? Love of teeth? Job security? How good are you at communicating and building a relationship with your colleagues and patients that is centred on earned trust and respect? Do you seek advice and education regarding failures? Everyone, but everyone, has failure. Those who highlight their failures can only have two outcomes. One, they may be reassured by colleagues that failure was inevitable for some reason or another and they should not feel aggrieved at the outcome. The other is that they receive advice on why it occurred. This is free education! If they can get good advice and learn then that previous weakness has been dealt with and it won’t happen again. Win-win, if you highlight your failures! My closest colleague has the greatest quip when being subjected to dental boasting. He looks them in the eye and asks, “Great, but can you prep?” He means prep a crown, complete a root filling, cement a bridge – live! In front of an audience of dentists? If the answer is no then perhaps there are shortcomings in your techniques and skills that should be improved. The most effective remedial steps you can take are to watch live demos, receive one-to-one teaching and engage in genuinely deep learning. Seek that help, until you yourself are happy to do it live! Do you love your job? Do you only love parts of it, or particular techniques or specialties? Find what you love and do that. When work becomes play, your play is also your work. It is a good place to be and is much safer. These questions can be answered in later articles, along with advice about how to steer your career in a positive way. When it comes to understanding success we should lead with another question. Does it mean being rich? Richer than who? Other dentists? American dentists? Is success having the time to do what you love outside of work? Is it, for you, having the daily satisfaction of a job well done? Or, is it just giving your family the security and lifestyle you feel they deserve? Is it adulation from others, Facebook likes and positive comments on your fissure staining on a LR7? We should take a pause, step back and ignore other people’s definition of their own success. Particularly if they flaunt it publicly. Therein lies a path to envy or even insecurity and self doubt. Achieving someone else’s success may feel good for a short while but they are a completely different person to you, and your long-term goals should be yours and yours alone. Find that goal. Make it what you believe success is for you and apply grit, learn the skills, get help with the mistakes (you will be amazed at how happy people are to help you), practice, work hard and, if you can, learn to speak and communicate honestly and from the heart. If success for you is NHS practice with a small contract and a quiet life for 30 years – well, that is really ok. You should be proud. Lots of dentists ask what I did to become a consultant. They want to teach, run a department and …use a microscope for check-ups! Then I tell them what my life is really like – boring meetings, understaffed, days when every patient is difficult. You want that? I then ask about their lives and at first I think, “Wow, no kids, so you have a Coupé? You get up at 8am?” The perception is often far from reality. So keep perspective. Set long-term goals and commit to honesty and quality in every aspect of your working life. Succeeding in the way you really want is the only achievement that really counts. I have one friend who wanted to understand just occlusion and tooth wear. They set a goal to become an expert in this niche. They became skilled and highly proficient very quickly. They asked for lots of help and they enjoyed the self-improvement process. This process never stops, by the way, so you had better enjoy it. I am a better dentist than I was five years ago, no doubt, and I look forward to trying to get better still. It may or may not happen but I will enjoy the effort in trying. 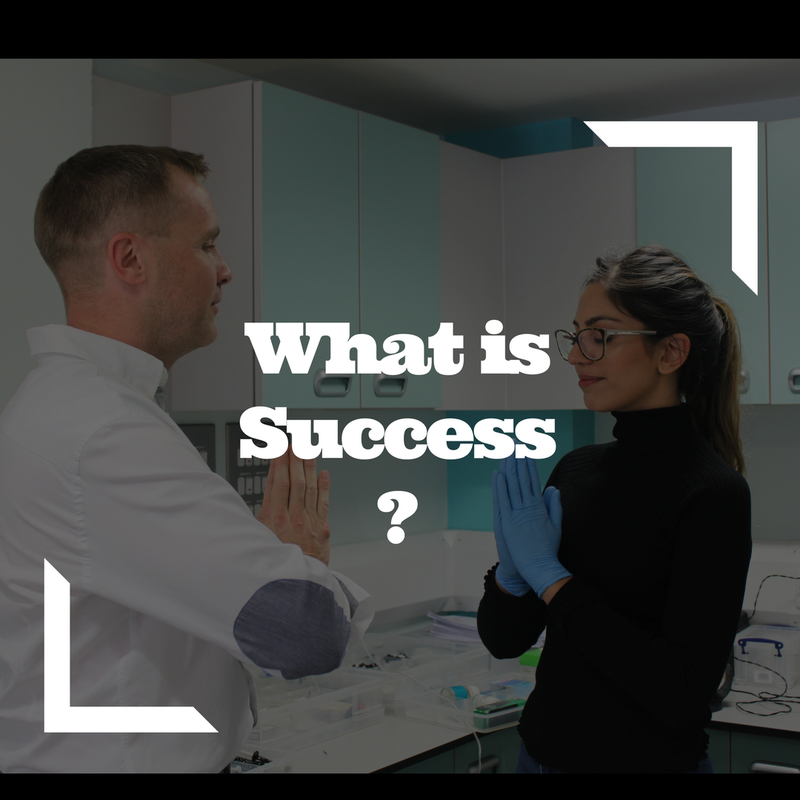 Are you successful? This is an irrelevant question. Have you thought, I mean really thought, about what success is for you? Once you have blocked out ALL other people’s version of success and found your own, then you will know. If you’re not there yet, then let’s head there together. I’ll enjoy helping you too!